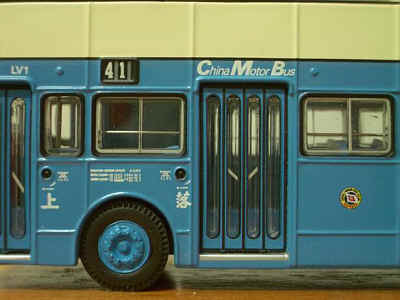 I have today received a further selection of photographs of the Best Choose 1/24th scale China Motor Bus DMS and these have now been added to the following page. My thanks to Best Choose for kindly supplying these. I had hoped to upload further photographs of 'real' buses taken at Disneyland Hong Kong and the Inspiration Lake Recreation Centre tonight, but with the receipt of the above mentioned photographs, time (or a lack of it!) has prevented me from doing so.These will therefore be added tomorrow, all being well! 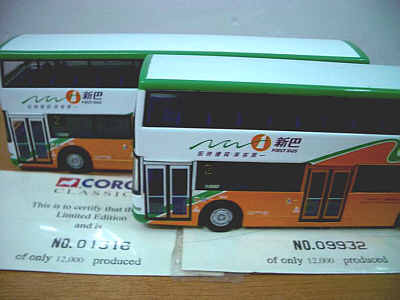 Following the recent information about the variation in the placing of the New World First Bus logo on the first 1,500 models of Corgi's Trident No. 44401, Phil Barton, who has Certificate No. 306 confirms that this variation does not apply to his model! I have just added a new page detailing another pre-production model, this again being a Corgi Leyland Victory Mk2, but this time a China Motor Bus version. Further details can be found here. 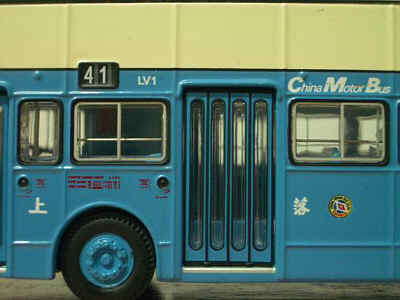 I have just added two new pages (4135 and 4138) to the resin section of the site detailing the two resin CMB Bedford OBs from 312 model. I have just received a sample of the new Alexander ALX500 bodied Volvo Super Olympian bus kit, courtesy of Creative Master Northcord Ltd. 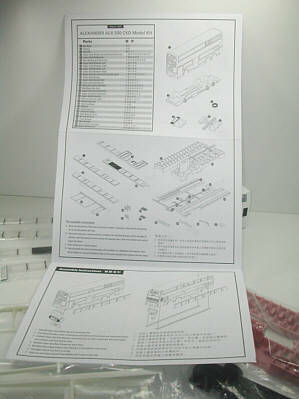 The box contains instructions on how to assemble the model, which are in both English and Chinese. 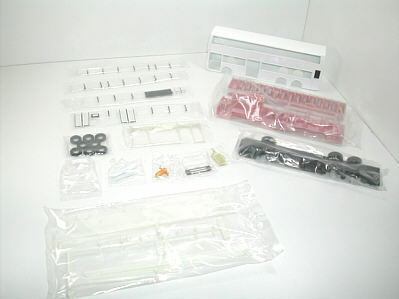 The kit comprises of thirty-one numbered parts. The body is painted in a white base coat, which is of a matt finish whilst the chassis is black. The interior moulded seating is pink. I will make no attempts to make the model as I do not have the patience or skill, so I will await someone who has to build their's and ask that they kindly send me a photo of the finished model. There are still quite a few photographs that have been sent to me over the past few days which I hope to upload to the relevant pages of the site shortly. My thanks to Jacky Ho for confirming that both the resin CMB Bedford OBs from 312 Models (as mentioned on 23rd August) are now available. Jacky has kindly provided photos of each and these will be uploaded shortly. 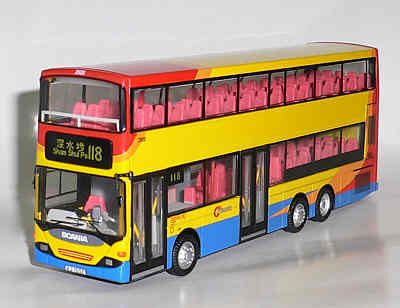 I have received an unconfirmed report that Drumwell are to issue a model of KMB's Volvo B9TL/Wrights fleet no. AVBW1. The model is expected to be released in September. Following yesterday's mention of a couple of pre-production models, I have tonight added details of a Corgi Citybus Ocean Park liveried Leyland Victory Mk2. Details of the second will appear shortly. 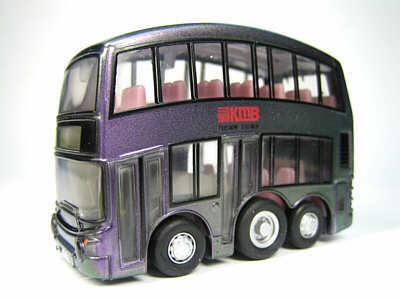 Just released in Hong Kong is this KMB metallic green Dennis Trident/Alexander cute bus. Further photos and details will appear shortly. I have recently been advised that there is a variation in the first New World First Bus model, Corgi's Alexander ALX500 bodied Dennis Trident (44401). It is believed that the position of the NWFB logo on both the nearside and offside of the first 1,500 models produced differ from those on the remainder of the production run. The above photographs show an early model (Certificate No. 1318) on the left, with the NWFB logo slightly more forward than that on the left (Certificate No. 9932). My thanks to CK Chow for providing this information. For those of you who are now going to check their model and find they have one in the 1-1,500 certificate series, perhaps you could let me know whether the above variation applies to your model - Thank you! A lack of time has prevented me from giving details of a couple of pre-production models tonight, but here are a few clues! Following the significant success that Alexanders have had in supplying its ALX500 body to Hong Kong operators in fully built-up and in CKD (completely knocked-down) formats, Creative Master Northcord Limited is following this trend and is releasing a special version of its very first model bus. 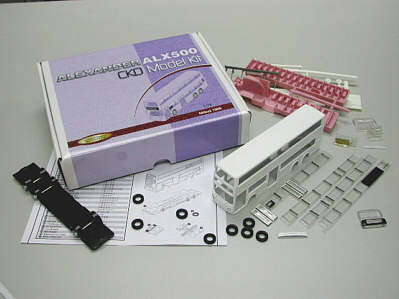 hkbus 1005 will come in a specially designed cardboard box, holding all the components that model collectors and model builders would need to build their own ALX500 model. Each model will come painted in all white and the interior components will be the colour of the plastic sprue. The model comes with full instructions in both Chinese and English language. Additionally, the instructions are enhanced with a detailed, fully-exploded diagram of how all the individual components fit together to give a fully built-up model. The rationale of offering this sort of model is that CMNL recognises that many modellers like to make their own creation – whether for the enjoyment of assembling their own product, or whether they want a model featuring their own colour schemes and external livery. This new model offers these combinations to be fully in the modellers’ own hands. 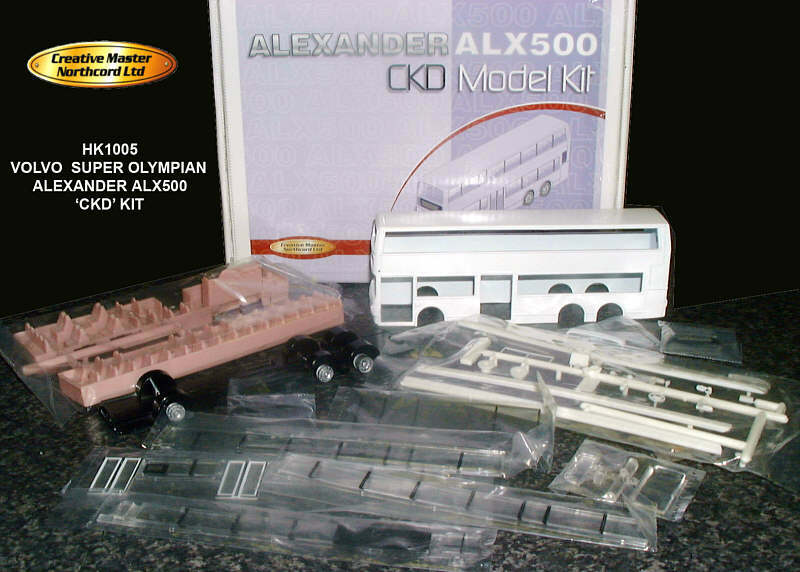 The brand new Alexander ALX500 CKD Volvo Super Olympian double-deck bus models will be distributed by John Ayrey Die-Casts Limited (UK), Porte Publishing Company (Japan) and Concorde Hobby Shop (HK) respectively. 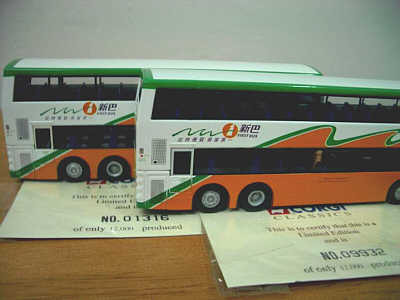 The hkbus 1005 model is an uncertificated model. I will be adding a new page for this kit later today. 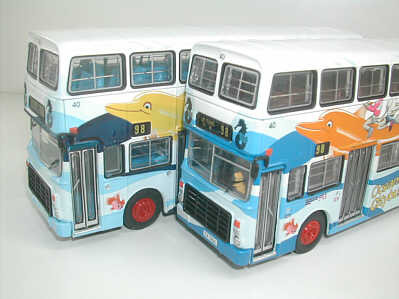 Later today I also hope to bring you details of a variation in a New World First Bus model, plus photographs of a couple of pre-production models from Corgi, showing differences between these and the finished models. I have received confirmation from John Ayrey Die-Casts that the Creative Master Northcord Ltd kit of a white Volvo Super Olympian/Alexander ALX500 (hkbus 1005) will be available in the UK, although probably not until mid October. 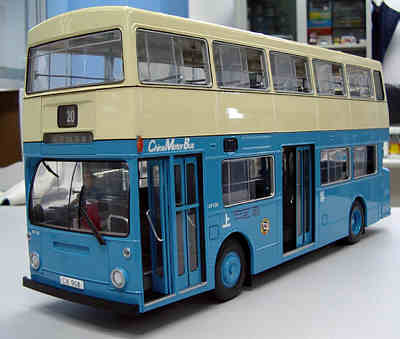 In addition to this news, John Ayrey Die-Casts have also confirmed the latest two Japanese models from CMNL (JB1010 and JB4001) are now available in the UK, as is Corgi's 1/50th scale KMB Leyland Atlantean (CC25602). 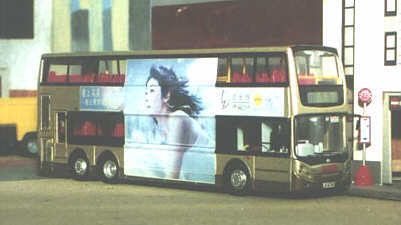 Some further photos have been added to the Exhibition on Hong Kong Buses 2005 page. I have received confirmation from Buses Model Co. that anyone who purchases their 60th Anniversary liveried China Motor Bus Olympian LM1 (L40806) can enter a lucky draw. 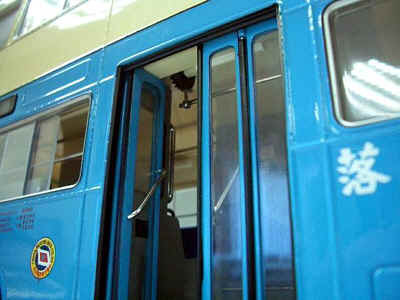 The Company is producing 30 special model buses as the lucky prizes. These models will not be available elsewhere. Anyone can enter the lucky draw, no matter where in the world they live. All Hong Kong winners we will be contacted by mail or email. Overseas winners will contacted by air-mail/email/fax, and the prize will be sent direct to the winner by DHL Express or Speedpost. I hope to be able to bring you details of the special prizes in due course. 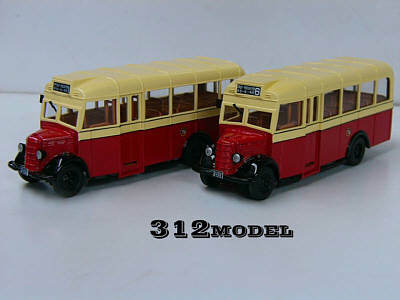 News of two new resin models from 312 Model has just been received. They feature China Motor Bus Bedford OB's registration nos. 4135 and 4138. No. 4135 is on route 1 and No. 4135 is on route 6. Further details will appear in due course. 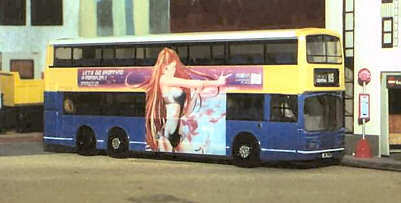 Bus adverts certainly bring a touch more realism to the model, as can be seen from the photos from David Rowe below. I have received some samples, thanks to Network Shuttle, of other adverts available from 80M Bus Model Shop. These feature different layouts for different bus types. All have been placed on a white background for scanning purposes. I have just added a couple of photos to the Xtra section of the site which show the Citybus and Long Win Disneyland Hong Kong operations. I have also added a new page for the Exhibition on Hong Kong Buses 2005, which includes photos taken by visitors to the Exhibition. These will be added to over the next day or so. The problems I have been experiencing over the past few days in receiving e-mails have now been resolved and I am now able to receive e-mails once again, either using my old e-mail address or the one mentioned on the site earlier today. I have also received those e-mails sent during the past few days. Thank you for you co-operation and I apologise for any inconvenience caused. A new page has tonight been added for the white Enviro 500 from Cars Workshop, which was released in Hong Kong on 18th August. This model comes in a clear display box with no outer card covering, nor does it have a limited edition certificate. I have assumed the model number to be 39403 (changed to 39400 in May 2006 following official release of 39403 a KMB champagne liveried Volvo B9TL model with updated Enviro 500 bodywork). Also added is a new poge for the Citybus Scania/Volgren (80802). I have received a number of photos taken at the 'The Exhibition on Hong Kong Buses', organised by 80M Bus Model Shop and I hope to add these to the site over the next few days. In the meantime, a few to whet your appetite! 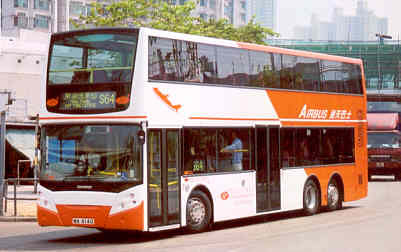 Released today in Hong Kong is the second version of Citybus's unique Scania/Volgren Fleet No. 2800 (80802), this time in Stagecoach corporate style livery. 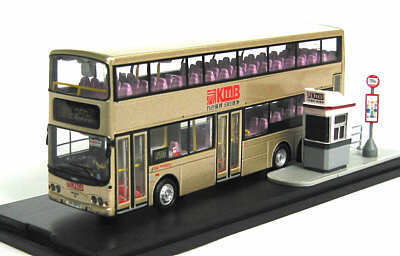 Produced by 80 Bus Model Shop, it is on route no. 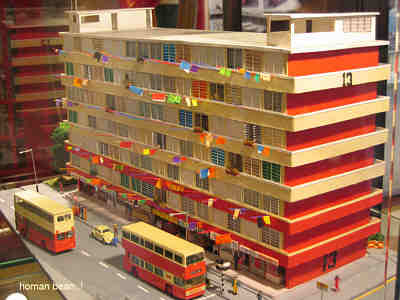 118 to Sham Shui Po and is limited to 2,500 pieces. I am informed that Cars Workshop have issued a plain white Enviro 500, pictured above. This model does not carry any route number or destination, but does display a windscreen Roadshow sticker. 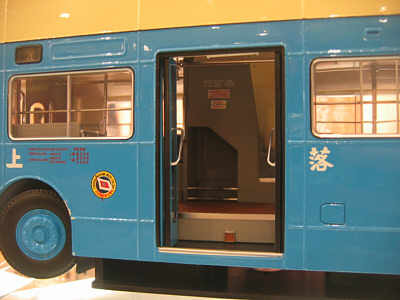 Best Choose have just announced that they are to issue a 1/24 scale model of a China Motor Bus DMS. Following yesterday's news of the forthcoming release of Citybus No 2800 in 'Stagecoach style corporate' livery, a new page has tonight been added to the Xtra section of the site which includes several photos of the real bus in pristine condition just before entering service. Once again thanks to Donald MacRae for his swiftness in providing these. The Exhibition on Hong Kong Buses, organised by 80M Bus Model Shop opens tomorrow (Thursday 18th) and runs until 29th August. It can be found at the Western Market Lobby, 323 Des Voeux Road Central and is open daily from 10.00hrs until 1900hrs. Admission is FREE. I hope to be be able to bring you photographs in due course. I am reliably informed that Citybus will release a 2nd version of their Scania/Volgren model (Fleet No. 2800) later this month, featuring Citybus's 'Stagecoach style corporate' livery. It is believed the route no. will be 118 to Sham Shui Po. The Cars Workshop KMB MAN/Volgren (39202) model announced yesterday has been released in Hong Kong today along with the Buses Model Co. China Motor Bus 60th Anniversary liveried Olympian (L40806). A new page has been added to the Xtra pages of the site, showing the new Long Win Enviro 500s mentioned yesterday along with a Doraemon liveried Trident. Tomorrow (Sunday 14th) sees the release in Hong Kong of the second version of the Cars Workshop KMB MAN/Volgren (39202). This version features AMN41 (KR6870) on route number 259D to Yau Tong and comes with an inspector's hut, bus stop and railing. It is limited to 2,000 pieces. 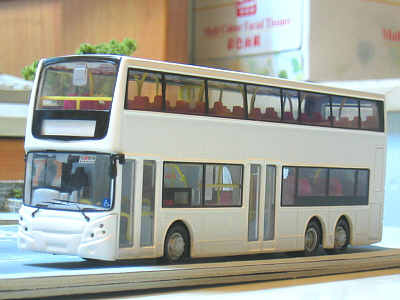 Following the news item on 26th July 2005 when I advised that I had received a reliable report that Creative Master Northcord Ltd were to produce a kit version of their Alexander ALX500 bodied Volvo Super Olympian, this has now been confirmed and the above photo shows one such example, which is to sell for HKD198. Long Win are now operating several Enviro 500s and it is believed that these, plus a further batch, will be used to operate the Disneyland Hong Kong services. These services, plus those operated by Citybus, are scheduled to start on Tuesday 16th August. Further photos will be added to the Xtra section of the site shortly and if you have any similar photos, please e-mail them to me. I am now on holiday for 1 week, so there will be no updates during this time. Normal service is due to resume on Saturday 13th August. Further photos of the forthcoming Buses Model Co. China Motor Bus 60th Anniversary liveried Olympian (L40806) have now been added, thanks to Jotus.com.